Nominations for Council accompanied with the nominee’s agreement in writing and items for consideration under other competent business should be lodged with the Secretary, c/o John Muir’s Birthplace Museum, 126 High Street, Dunbar, EH42 1JJ by Friday 23rdNovember 2018. For the complete contents of this newsletter please see FoJMB Newsletter #40, Spring 2018. For the complete contents of this newsletter please see FoJMB Newsletter #39, Winter 2017 or go to the next page for a link to the Scribd version. Craig’s talk will give his purely personal ‘take’ on what is undoubtedly a local wonder and well worth a visit, especially if you can manage that slightly awkward descent and confront the extraordinary rock formations head on and close-up, as Hutton did, in 1788, when he and his two companions got off their boat at Siccar Point. 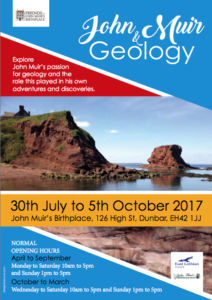 Craig will also explain the Unconformity’s main contours and its significance in lay-terms and to convey Hutton’s claim (made by others) to be the Father of Modern Geology, which is undoubtedly strong. Photographs that Craig and his daughter took on a recent descent to Siccar Point will provide a dramatic backdrop to this illustrated talk. Nominations for Council accompanied with the nominee’s agreement in writing and items for consideration under other competent business should be lodged with the Secretary, c/o John Muir’s Birthplace Museum, 126 High Street, Dunbar, EH42 1JJ by Friday 24th November 2017. For the complete contents of this newsletter please see FoJMB Newsletter #38, Autumn 2017 or go to the next page for the link to the Scribd version. 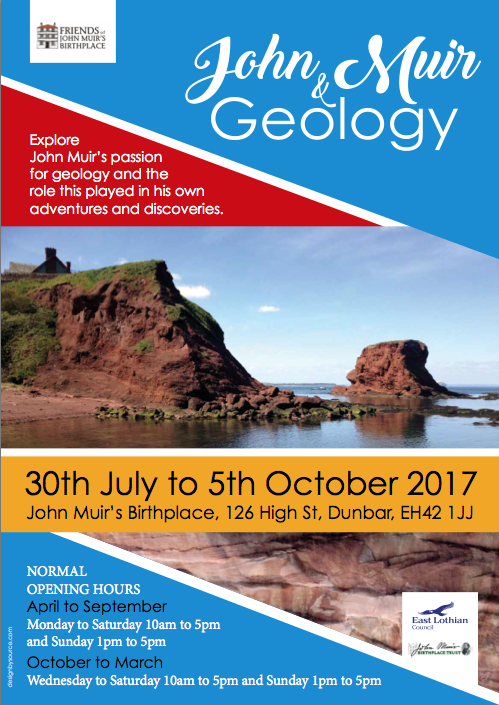 The second Friends’ exhibition of 2017, ‘John Muir & Geology’, runs in the Birthplace from July 30th until October 5th and explores John Muir’s passion for geology and the role this played in his own adventures and discoveries. In addition to the 8 exhibition panels and the display case contents, Ross Combe has also commissioned a 3D print of Yosemite Valley which illustrates the glacial action of its formation. Ross has also installed interactive buttons below each panel that, when pressed, give additional audio commentary.